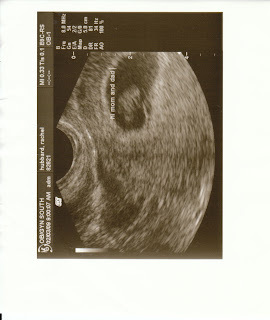 The Hubbard Happenings: First Utrasound pic of Baby Hubbard #2! Here if the first utrasound picture of Baby #2! The peanut shape inside the darker spot is what you're looking at:) It was a lot easier to see in real time while they did it because you could see the heartbeat blinking! I am so excited and I can't wait to meet the new baby Hubbard. See you guys soon.